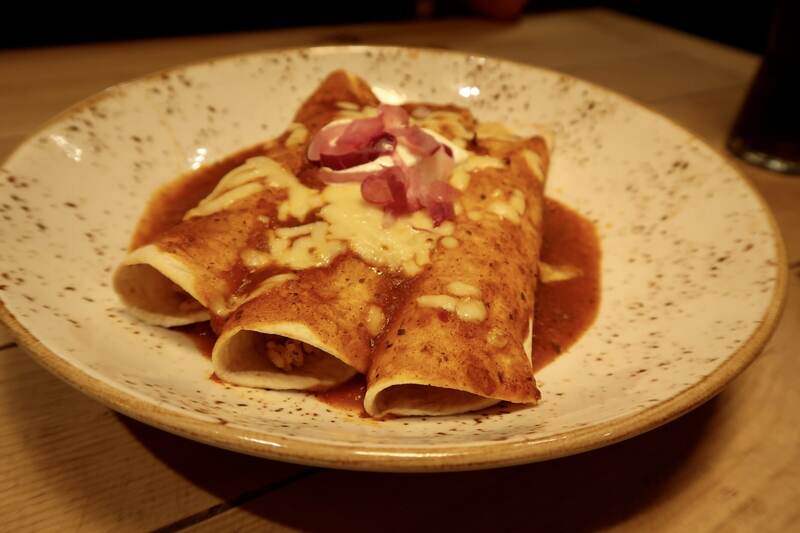 Last month we were invited to Chiquito to try out their new menu, which included the new ‘build your own tortillas’ section, so we headed down to our nearest restaurant in Union Square, Aberdeen. 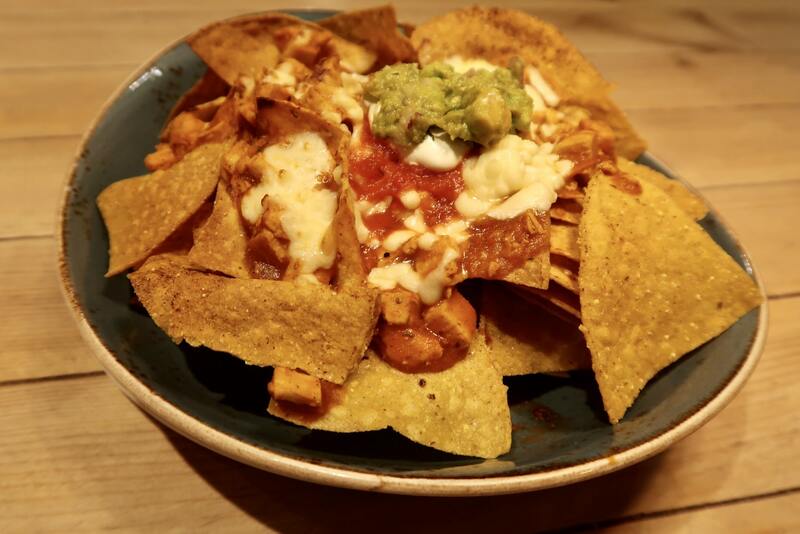 We had to start off with some nachos to share – we love a good portion of nachos even S, well the tortilla chips anyway leaving the toppings for mum and dad! 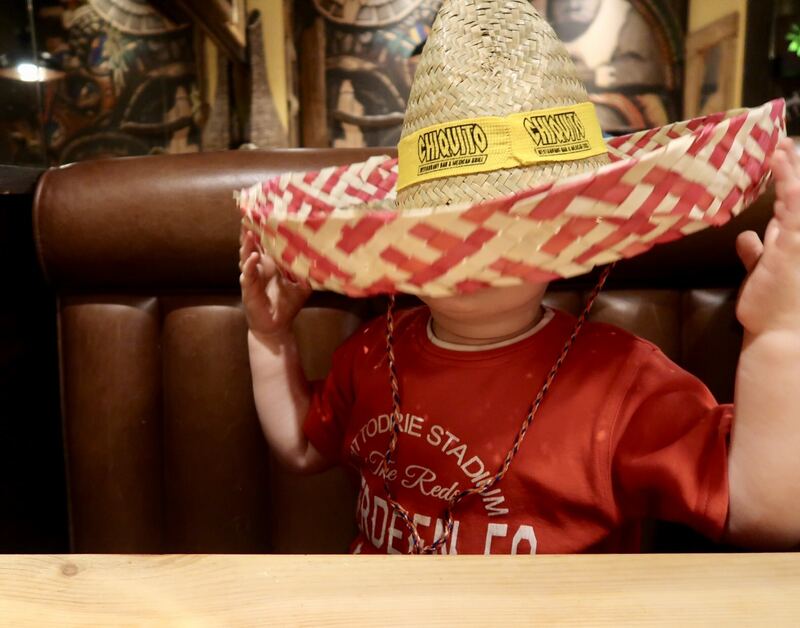 There was plenty to chose from on the kids menu from a mini BBQ chicken wrap, cheeseburger & fries to Chiquito margarita ‘pizza’. 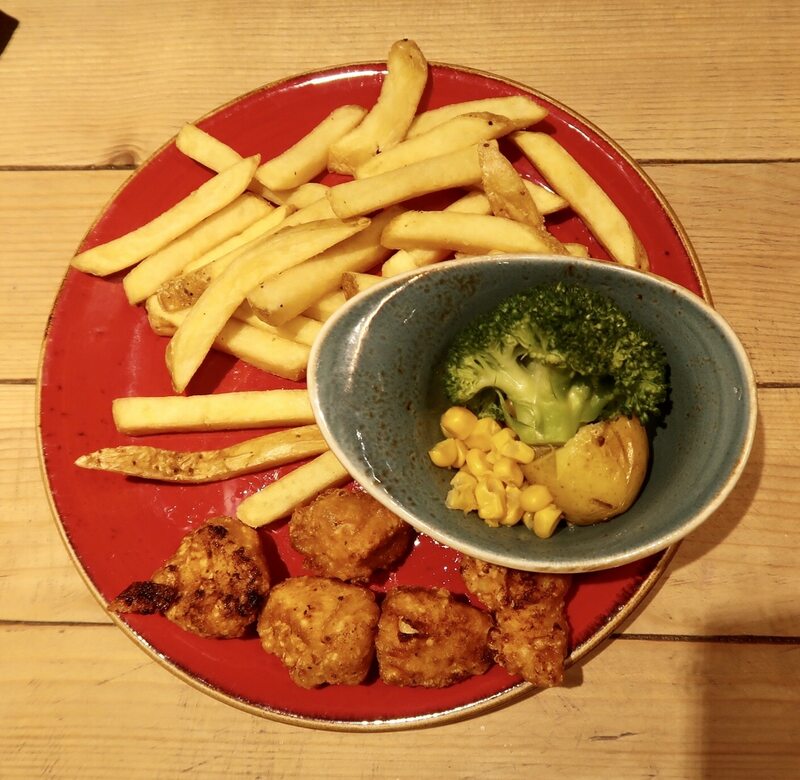 S opted for the chicken poppers – oven baked and battered chicken fillet pieces served with skin-on-fries. Also with tomato sauce and mayo for him as he can’t seem to have a main meal without his two favourite condiments. 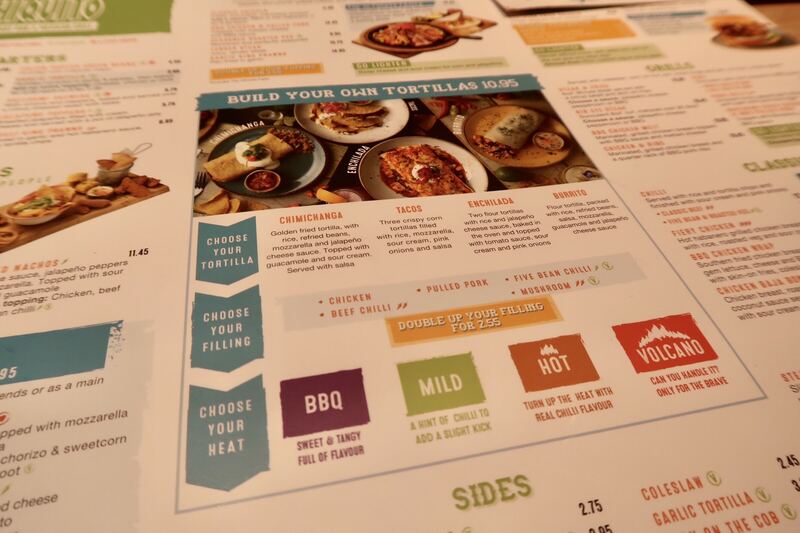 Chiquito also have a young adult menu which has a big range of options for young adults to choose from, which I think is a fab option as there is so much choice and also means there is a middle portion size between the kids menu and the adults menu. There are then five filling options to choose from – Chicken, Pulled Pork, Five Bean Chilli, Beef Chilli or Mushroom. Finally you choose which sauce you would like – BBQ, Mild Sauce, Hot Sauce or Volcano Sauce. I opted for the enchilada, with the chicken filling and BBQ sauce. As someone who cannot handle much spice the BBQ sauce was the perfect choice. One option I wish I had gone for was the option to double up your filling for £2.55 – mainly because of the food envy when A’s arrived! 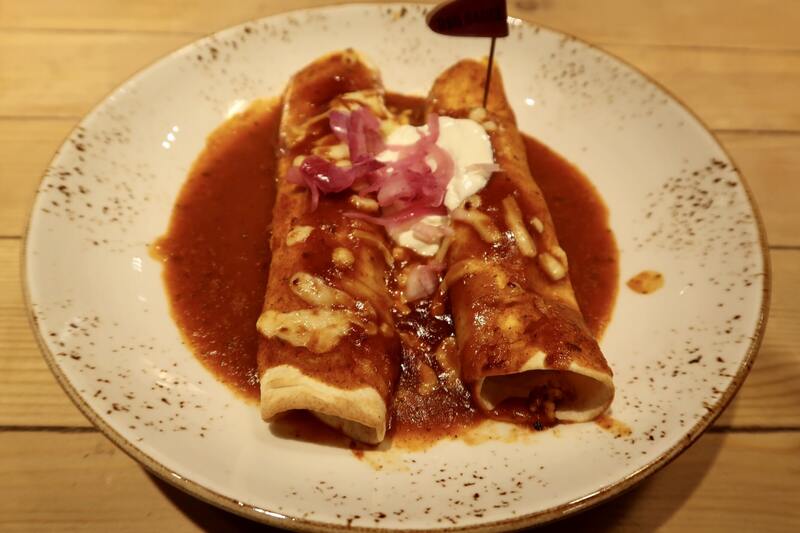 A opted for chicken filled enchiladas with the mild sauce (he’s not a big spice fan either). He doubled up, which comprised one extra enchilada. 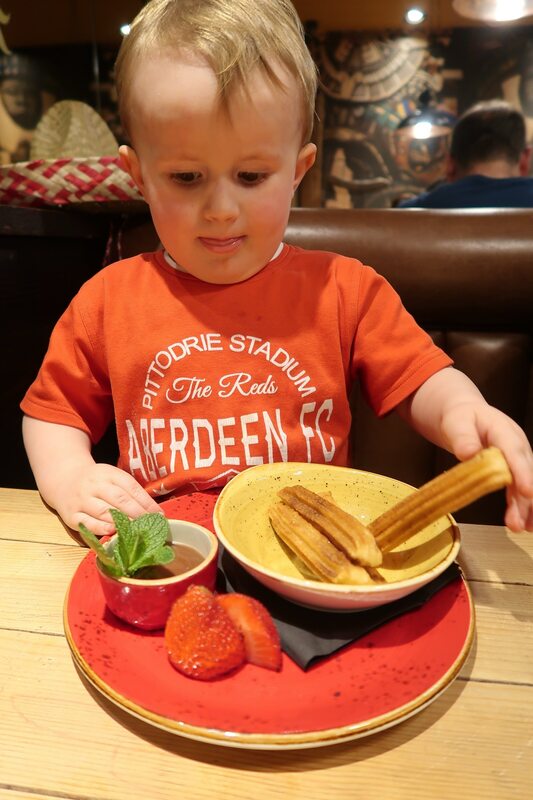 For dessert S opted for the kids churros with chocolate sauce – as soon as he seen it coming he couldn’t wait to tuck in! 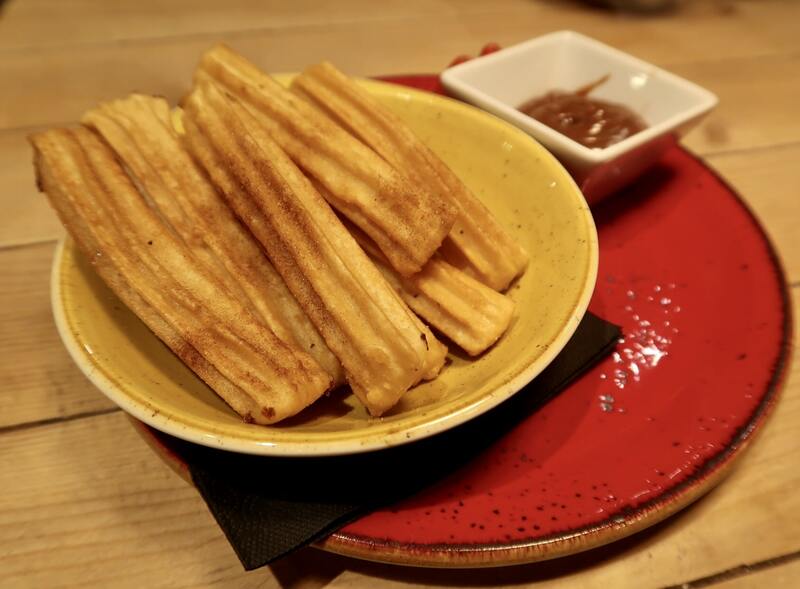 We also ordered an adults portion of the churros as just like S as soon as I see churros on the dessert menu I find it hard not to choose them! 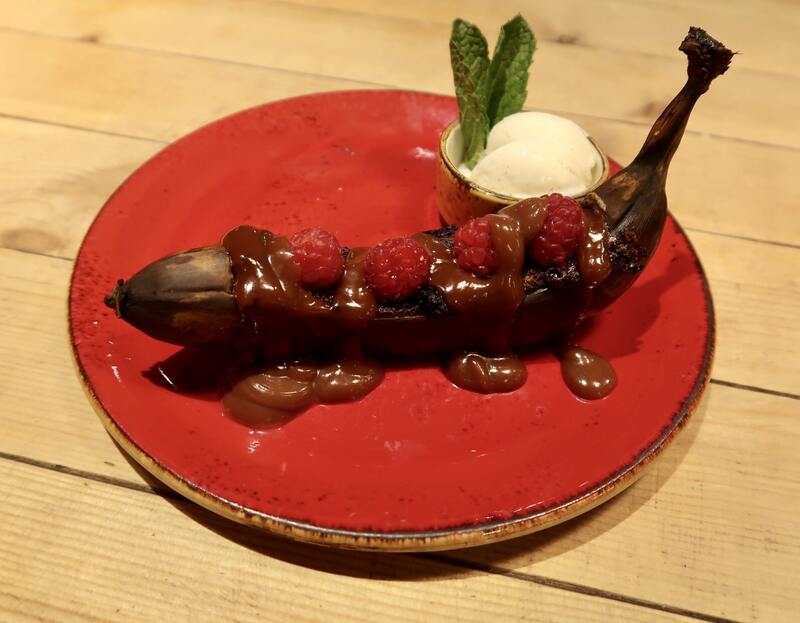 The brownie baked banana on the dessert menu jumped out at us straight away – we needed to give it a try! 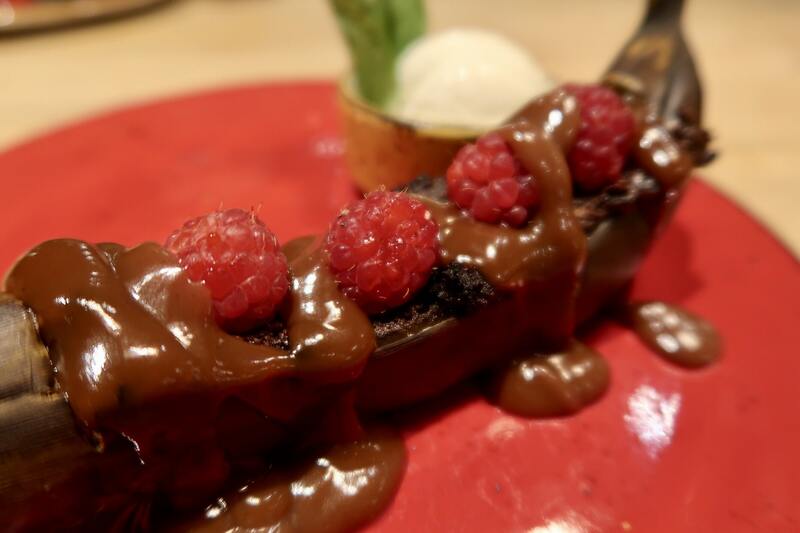 A banana stuffed with chocolate brownie, baked and topped with raspberries and chocolate sauce served with ice cream on the side it was definitely an interesting twist on the classic chocolate brownie. 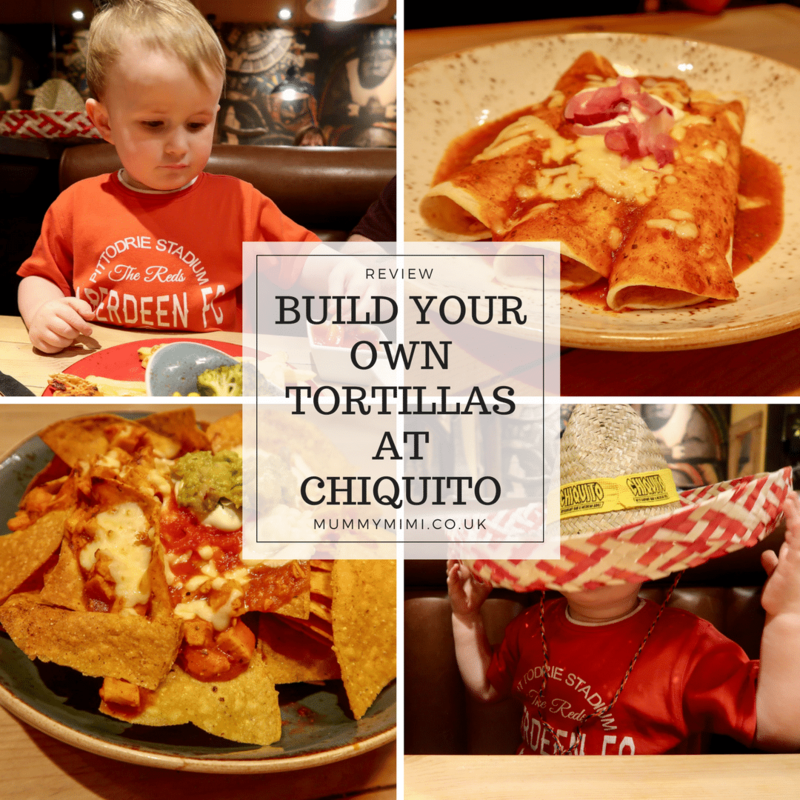 A and I both thought the options to create your own tortilla was a great addition to the Chiquito menu, especially for someone like me who is a bit of a picky eater! I love Mexican food but always need it to be on the mild side. 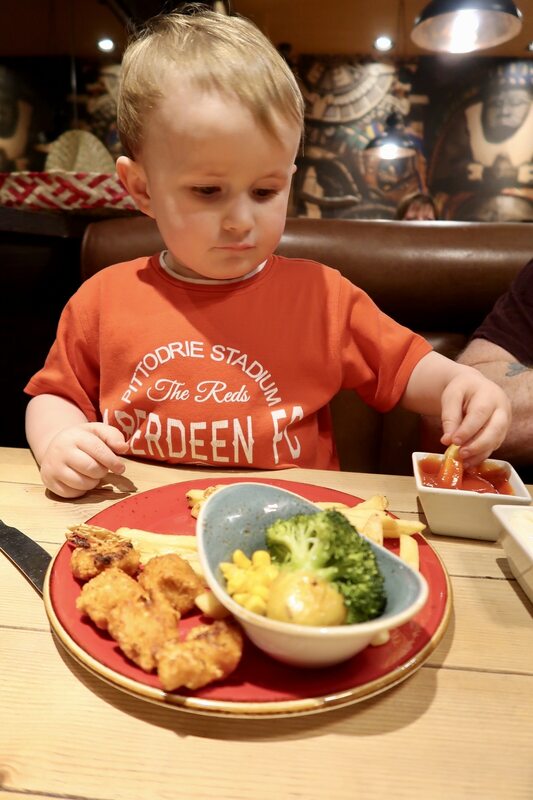 They had a great range for kids which means it’s definitely on our list for meal out with S as we know there will be something on the menu he’ll enjoy!